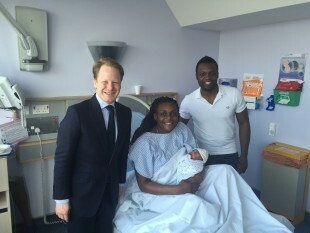 Ben Gummer MP with Laure Djida, Moustapha Djida and their newborn baby on a visit to St Thomas' Hospital today. Health Minister Ben Gummer MP today visited a maternity service to see for himself the kind of practical improvements that have resulted from providers putting patient feedback at the heart of how they deliver healthcare. He visited St Thomas’ Hospital’s postnatal ward, in the centre of London, where staff are making the early days of parenthood a closer experience for the families involved. The initiative is a finalist in the national FFT Awards. The Guy’s and St Thomas’ NHS Foundation Trust has listened to comments from new mums about the need to have the support of their partners or other close family members on the first few nights after giving birth and they have introduced a scheme that allow partners to stay overnight. Hundreds of families are now benefiting from this facility every month. Before the initiative, visiting was allowed only during the day and some patients said this caused “anguish” at what should be a joyous time. Maternity staff, who provide services for 7,000 births every year, reviewed patient feedback and found that issues arising from separation during the first few nights were frequently commented on by patients. They ran a pilot project to test solutions for the problem. This involved buying recliner chairs for partners to use and introducing “contracts” with the couples involved so that necessary consents were in place. Since the initiative was launched, the number of women who would recommend the postnatal services provided has risen from 66 per cent to 90 per cent. There have also been other benefits such as an increase of women who are able to breastfeed successfully and a reduction in anxiety among the patients. The trust has adopted the scheme permanently and is now considering a more open policy across other inpatient wards. We are very pleased to be able to welcome a partner to stay overnight on the postnatal ward. It’s so important that they can take part in caring for both mother and baby. This extra time spent with mum and baby can help family bonding and reduce anxiety and stress. This initiative was prompted by the feedback we received from our parents, including user members of our Maternity Service Liaison Committee, and has proved really successful. It’s definitely enhancing the care and positive experience we provide. I want the NHS to be the safest, most transparent and compassionate healthcare system in the world. Feedback from patients and staff is essential to improving care. The Friends and Family Test is an amazing operation across the NHS. With almost eighteen million responses since its launch in 2013, it has become the world’s largest and clearest source of how patients rate their care and experience. I urge all patients to help drive forward the NHS's culture of learning and improvement, by asking to complete the test when they use an NHS service.